Shipping Furniture To Spain - Why Is A Removals Company With A Spanish Base Important? Shipping furniture to Spain should be done by a professional, reliable removals company which specialises in international moves. The last thing anyone wants to be worrying about is whether their furniture and possessions are safe and are being looked after. Some companies have a base in Spain � why is this important? Moving furniture to Spain requires experience and knowledge of the area. 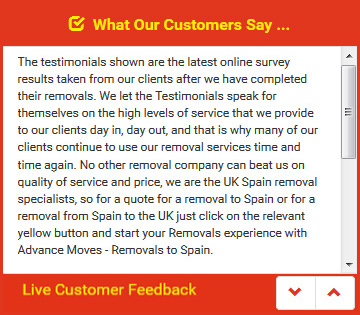 If a removals firm has a base in Spain, it shows that the staff definitely know Spain well. If they are established enough to have offices there, you�ll know that once you arrive you can be sure that there will be someone in Spain to help with ad hoc queries and the like. It is also useful for your removals company to have a base in Spain because they can arrange storage for you should you need it. Delays happen, property sales can fall through or take longer than expected, and by using a company that understands the local area, you will find it easier to store your furniture and possessions. Without a Spanish base, you could find yourself stranded as the removals team returns to the UK. Otherwise, the price of your move could go up considerably if the team has to stay in Spain longer than expected. A base in Spain would prevent - or at least limit - the issues in this situation. Removals to Spain are exciting, but if things do go wrong, you need a removals firm which can cope with the unexpected. A base in Spain will help them do just that. Advance Moves offer shipping furniture to Spain services including storage and packing. See our website at http://www.advancemoves.com/ for details of everything we can handle on your behalf during your move to Spain. If you need to contact us, please call us on 0871 218 0612 or email info@advancemoves.com.